How to watch Adventure Time: Season 6 (2011) on Netflix South Africa! Sorry, Adventure Time: Season 6 is not available on South African Netflix, but you can unlock it right now in South Africa and start watching! With a few simple steps you can change your Netflix region to a country like Argentina and start watching Argentine Netflix, which includes Adventure Time: Season 6. We'll keep checking Netflix South Africa for Adventure Time: Season 6, and this page will be updated with any changes. Adventure Time: Season 6 is not available in South Africa BUT it can be unlocked and viewed! Young Finn and his shape-shifting dog buddy, Jake, have a series of surreal adventures as they journey through the postapocalyptic Land of Ooo. A clever boy and his magical dog travel through a strange land. But vampires and tricksters won't leave them alone! 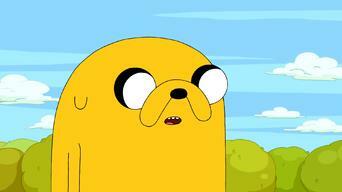 Season 1 of Adventure Time has 26 episodes. Because different Netflix countries have different availability for episodes, you'll need to check the episode listing below to see which are available in South Africa. When Finn and Princess Bubblegum accidentally create an army of candy zombies, they must work to keep the Kingdom safe. But, hey, it was an accident. 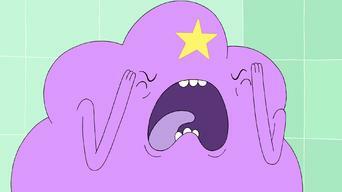 After Lumpy Space Princess sinks her lumpy teeth into Jake, he starts to turn all lumpy. So Finn has to travel to Lumpy Space for a lumpy cure. Finn sets out on a quest for a book that will make him a better hero. But will he learn all he needs to know on the journey? It's deep, man. Finn and Jake must figure out how to return a jiggling little creature to its mother. Why? Because it jiggles. A lot. Like soooo much it's annoying. Finn and Jake have been captured by the Ice King! He is holding them in a cell with a bunch of princesses! One of whom he will marry! Oh the humanity! On a very special "Adventure Time," Finn and Jake go on a quest while protecting Tree Trunks and learn that heroes come in all shapes and sizes. Aww. You'll learn a valuable lesson in this episode: Never trust a heart named Ricardio because he is up to no good. So now you know. When a bunch of businessmen wash ashore, Finn and Jake see an opportunity to sit on the couch and get fat and lazy. Because why not? 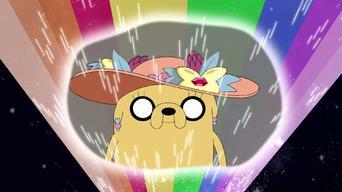 Jake tries to get Rainicorn and Finn to become friends so he can stop splitting his time between them. Be careful what ya wish for, Jake. When Finn meets a sad mountain, he sets out to make him happy, while making everyone else unhappy and then they all become sad. Finn single-mindedly pursues the powers an old wizard offers him, until he learns that with great power comes... blah, blah, blah... all that. You know how Finn and Jake LOVE their tree fort? Well, it turns out Marceline owns it and she wants it back. Vampires can be sooooo mean. After Finn and Jake enter the City of Thieves to reclaim a young girl's possessions, they find themselves tempted to become thieves themselves. Some mean old witch steals Jake's magicalized powers, and he and Finn have to get them back. Without magic!!! After Jake pulls off the most awesome prank EVER, Finn gets back at him in the most obvious way -- by building a Never-Ending-Pie-Throwing-Robot. In order to overcome the Fear Feaster (the most fearsome guy ever), Finn must overcome his most fearsome fear. Guess what! 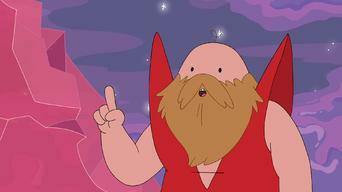 The Ice King is FINALLY getting married and asks Finn and Jake to throw him a Manlerette Party. Sounds awkward. A magical man turns Finn into a foot. Really not much more you can say about that. I mean he's a foot, you know? And that's just... wow. You know who's not such a bad guy after all? The Duke of Nuts. You wanna know why? Well just watch this and find out. Donny the Ogre is a jerk. But when you're an ogre, what else is there to do? Just be a jerk and all, that's what. So Finn stops him. The end. You know what's not cool? Being turned into a vampire's servant. You know what is cool? Having a friend like Jake who can save you. 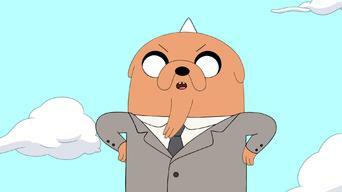 Jake is all like: "Don't go into that dark dungeon!" And Finn is all like: "Whatever, it's cool. I am going to explore it!" Guess who is right? When Princess Bubblegum asks you to throw the Ice King in jail because he did something wrong, you do it. Right? But what if she is wrong? Hmm. When it's raining knives outside, it's best to stay indoors. Unless of course Jake's imaginary monsters come to life and you have to battle them. Finn finally meets his heroic idol, only to discover he is a brooding old hermit who has given up adventure. DO NOT FOLLOW IN HIS FOOTSTEPS, FINN! Season 2 of Adventure Time has 26 episodes. Because different Netflix countries have different availability for episodes, you'll need to check the episode listing below to see which are available in South Africa. Unable to give a sick Jake an entertaining story, Finn sets off into the woods to discover a true story. 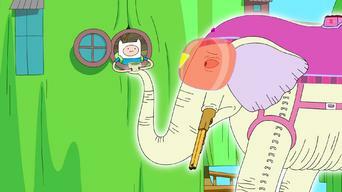 Finn and Jake try to find a girlfriend for a giant snail so that it will stop wrecking their treehouse. 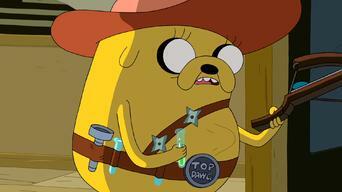 Finn is kidnapped, but Jake's short attention span means rescue is dubious. 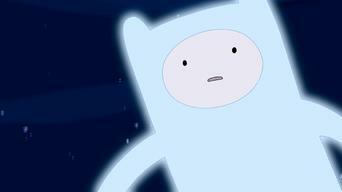 Finn swears a life of nonviolence right before a race of indestructible crystal-men abduct him to another dimension. 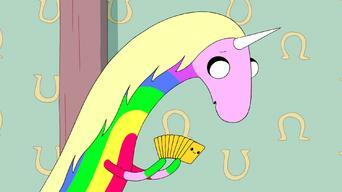 Anxious about meeting Lady Rainicorn's parents, Jake tries to pass himself off as a Rainicorn. An evil witch threatens to crush Jake to death if Finn doesn't deliver her the hair of a princess. While he's away, Finn and Jake sneak into Ice King's fortress. Finn and Jake are given one of the highest responsibilities: transporting and guarding the rarest pastry in the Candy Kingdom. Given the duty of protecting three magic beans, one evil and two goods, Finn and Jake decide to plant them to find out which is which. After defeating their king, Finn becomes the new ruler of the Goblin people, and finds that their strange ways are too difficult to understand. Nervous about giving a speech at Princess Bubblegum's science conference and barbecue, Finn finds a magical pair of glasses that make him smart. 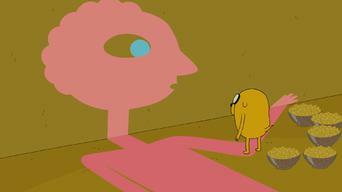 Finn and Jake become trapped inside one of BMO's video game creations. After accidentally killing Princess Bubblegum's beloved plant, Finn and Jake travel to the land of the dead to bring it back to life. Having always thought he is the only human left in the Land of Ooo, Finn believes he has discovered a tribe of primitive humans living underground. While traveling on a train, Finn and Jake find themselves in the middle of a murder mystery. 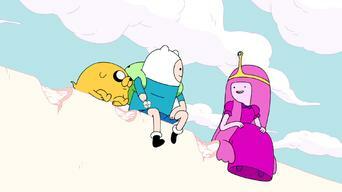 Jake and Marceline give Finn conflicting advice on how to ask out Princess Bubblegum. Finn and Jake must save a group of clueless, party-minded teddy bears living inside the belly of a monster. An enormous maze tests the limit of Jake's stretching power. Finn and Jake set out to make their own movie, but have conflicting visions of what their movie should be. Finn and Jake ask Marceline the Vampire Queen to turn them into vampires. However, she isn't interested and tricks them into thinking she has. 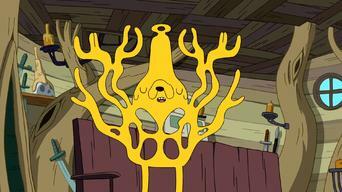 The Lich, the greatest form of pure evil in Ooo, is accidentally unleashed. Finn and Jake set out on the most serious adventure of their career. With the evil Lich seemingly defeated, Finn and Jake are uneasy with their success because of its great cost. Season 3 of Adventure Time has 26 episodes. Because different Netflix countries have different availability for episodes, you'll need to check the episode listing below to see which are available in South Africa. Finn and Jake come under attack in their home from a race of super-evil creatures who are too cute to be taken seriously. Finn and Jake end up in a haunted arena, and it looks like there is no escape -- unless they can win a fight against ghost gladiators. When Marceline the Vampire Queen falls into a deep sleep, a mysterious stranger sends Finn and Jake into her mind to awaken her. Punished by Finn and Jake for a misdeed, the Ice King hires a bully to beat them up, unaware that his employee is a hit man who intends to kill them. Finn is glad that Princess Bubblegum has regressed to his own age -- until a challenger for the throne arrives to unseat the newly under-age princess. Finn and Jake battle with the Ice King, and a fire-breathing wolf cub lost in the snowy woods finds an unlikely friend in a snow creature. In a parallel universe where, genders are bent, Fionna turns to her magical cat, Cake, for romantic advice on her date with Prince Gumball. 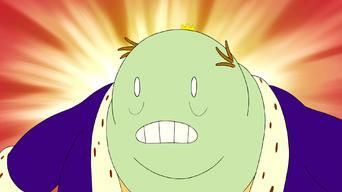 The king and queen of Lumpy Space ask Finn to find and return their Lumpy Space Princess, who has been living in the woods and mistaken for a monster. The Ice King puts a paralyzing potion on Finn and Jake. The Ice King wants to bond with them before un-freezing them, but the duo flatly refuses. The Ice King enters a battle of wizards from all over the Land of Ooo to win a kiss from Princess Bubblegum -- which Finn and Jake attempt to prevent. In order to recover stolen items shielded by a magic door, Finn and his friends must form a band. Creative differences and tensions get in the way. When Tree Trunks finds her apples have gone missing, Finn and Jake search the criminal underworld of the Candy Kingdom to recover them. When Cinnamon Bun's snacking gives rise to a new wave of Candy Zombies, Finn and his friends are tasked with creating an antidote to the plague. Susan Strong returns and asks Finn and Jake to save her people from the Glubs, but Finn's past experience gives him reason to distrust her. Finn tries to stop a deer from licking the Candy Kingdom people, then awakens in a hospital to find everyone missing except Jake, who is acting weird. Princess Bubblegum invites Finn and Jake to a costume party, but the fun ends when it appears that the guests are being killed, one by one. When Jake has a dream that seems to foretell his death, Finn is dismayed that his furry friend does not take it seriously. A tiny cat assassin armed with poison threatens to kill Jake unless he kills Wildberry Princess. When Finn and Jake come across the Ice King's video diary, they have a chance to unearth his secrets. Now that Finn and Jake have discovered the Ice King's video diary, how will they use the secrets they have learned? After sneaking into Marceline's house and hiding in her closet, Finn and Jake witness some weird behavior when they spy on her. In an attempt to help Finn get over his feelings for Princess Bubblegum, Jake looks for a replacement princess to mend Finn's broken heart. A secret war takes place in the library between tiny paper people and mold creatures, and Finn is drawn right into the middle of the battle. Finn sets out to find a cyclops's magical tears to cure his injuries, but struggles because of his stubborn inability to follow the advice of others. Finn and Jake venture into the cemetery to find out what caused the Ghost Princess's death, hoping to solve her murder. Jake's dad appears before them in a holographic message that presents them with a mysterious and dangerous challenge. Season 4 of Adventure Time has 25 episodes. Because different Netflix countries have different availability for episodes, you'll need to check the episode listing below to see which are available in South Africa. Finn's growing affection for Flame Princess leaves him blind to the fiery consequences of getting too close to her. 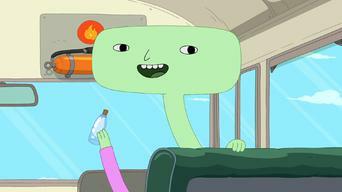 Cuber, a being from the future, hosts short stories about the five senses starring Finn and Jake, BMO, Princess Bubblegum and others. When Tree Trunks and Pig fall in love, their public displays of affection begin to bother everyone around them. When they awaken in the dungeon-like Nightosphere with no memory of how they got there, Finn and Jake seek out Marceline's father for help. 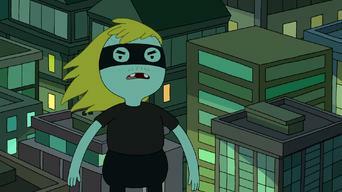 Finn and Jake race to save Marceline from her father, who turned her into a demon. Meanwhile, Jake learns the truth about the Nightosphere's bananas. When Finn befriends a bear that starts to act and dress like him, Jake begins to worry that it's trying to steal Finn's identity. An encounter with an Alpha Hug Wolf makes Finn start turning into a Beta Hug Wolf, and only Jake can reverse the curse. The princesses start losing body parts, which the Ice King is using to make a hideous princess "wife" of his own. 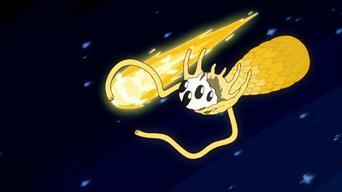 Afraid that she won't live forever, Princess Bubblegum creates an eternal sphinx called Goliad to succeed her, but the creature soon turns on her. Finn finds a magical porcelain lamb that sends him to the spirit realm. As his friends try to rescue him, Finn gets help from the Ice King. As part of the research for her book on men, Lumpy Space Princess takes an undercover job working for Finn and Jake and learns some surprising facts. Finn and Jake attempt to solve a hostage crisis in Candy Kingdom, but the culprit turns out to be a baby cookie who just wants to be a princess. When Finn agrees to play Card Wars with Jake, he soon discovers why no one else wanted to: Jake is a ruthless competitor. Confronted by his brother, Grob Gob Glob Grod, Magic Man switches bodies with Jake to avoid being sent back to Mars to stand trial. 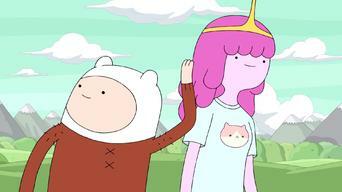 Finn thinks Princess Bubblegum is just jealous when she tries to warn him of Flame Princess's fiery dangers. When Finn's sock goes missing, BMO's search for it turns the story into a black-and-white detective movie. When Finn has a particularly vivid dream populated by everyone in Ooo, he discovers that he and Jake are trapped in their own subconscious minds. When Finn and Jake disappear during a battle with the Ice King, Princess Bubblegum and Lady Rainicorn set out to find them. Princess Bubblegum confronts the Earl of Lemongrab when she catches him spying on her subjects in their sleep. Finn and Jake encounter a barn-like being called the Farm and challenge it to a battle, but they end up fighting each other instead. 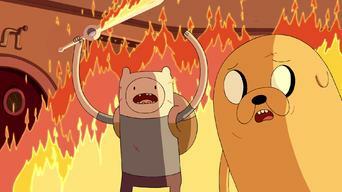 While on a mission for the Flame Princess, Finn and Jake attempt to prevent a plot to kill her father, the Flame King. Finn and Jake help defend the River Scamps from the Mega Frog that's terrorizing Woobeewoo Village. 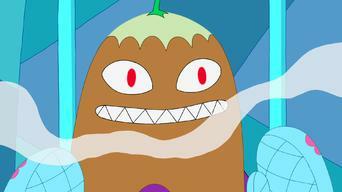 Gunter steals the Ice King's Demonic Wishing Eye and uses it to create shape-shifting clones of himself that overrun Ooo. When Marceline writes a song with the Ice King in a brief moment of friendship, they discover that they knew each other centuries ago. When Finn's nightmare about Billy turns out to be a premonition, he and Jake set out to save all of Ooo from the undead Lich. 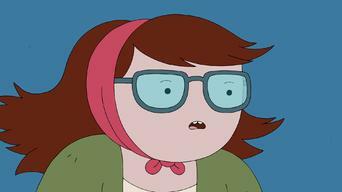 Season 5 of Adventure Time has 42 episodes. Because different Netflix countries have different availability for episodes, you'll need to check the episode listing below to see which are available in South Africa. After chasing the Lich through a portal, Finn and Jake meet a wish master, and Finn makes a wish that has unexpected consequences. Transported to an alternate reality where he's a peasant boy, Finn discovers the Ice King's crown, which makes him go mad with power. In Cuber's latest collection of stories, Jake tries to cast a spell from a book of nursery rhymes, Marceline encounters a Rock Giant and more. Finn and Jake's Frisbee gets stuck in a giant tree. When Finn tries to retrieve it, the creatures who live in the tree take him prisoner. Jake becomes the proud father of five puppies and goes to great lengths to keep them safe but soon realizes he might be a bit overprotective. Tired of being stopped everywhere he goes, Finn creates an alter ego named Davey. But when Davey starts to take over, it could spell disaster. Finn and Jake investigate a distress signal sent out by the Earls of Lemongrab and discover that their candy stores are all empty. A wizard's magic brings Finn's hat to life, but unfortunately, it has a mind of its own -- and it wants to do evil things. The princesses are tired of the Ice King's terrible stories about Fionna and Cake, so Marceline floats by and shares a much better tale. Flame Princess is worried that she may be evil, so Finn tries to convince her that she's not. But then he starts to have doubts of his own. Lost in the badlands, Finn and Jake are rescued by former goblin king Xergiok, who claims that he's changed his evil ways. Marceline recounts what life was like 996 years ago, when Simon became corrupt and turned into the Ice King after the Mushroom War. 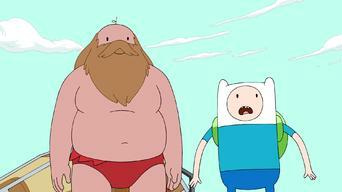 Finn and Jake race to thwart the Ice King's plan to wipe out everyone in Ooo with a computer virus, except for himself and Princess Bubblegum. Questioning his relationship with Flame Princess, Finn retreats to a pillow fort, where he falls asleep and dreams of marrying a pillow woman. BMO is snatched up by an eagle, who takes it back to her nest. After escaping, BMO befriends a lost bubble and a giant baby. Angry that he wasn't invited to the princesses' potluck, Ice King crashes their party, intent on ruining the fun. Finn and Jake meet a horse with the power to make sad people happy, a trait that comes in handy when they face an angry spirit. 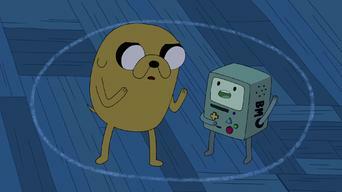 When Finn and Jake play a game to see who can keep quiet the longest, a confused BMO thinks something's wrong with them. 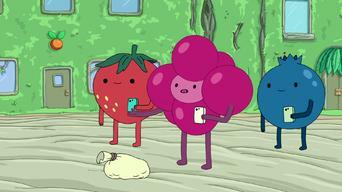 Peppermint Butler thinks Princess Bubblegum needs to get out of the lab more often, so he chooses a suitor for her named Braco. Ice King decides to give up his efforts to win over Princess Bubblegum and heads out to sea, but soon finds himself shipwrecked on a strange island. Jake Jr. has been kidnapped by a mysterious man who orders Jake to get his old gang back together to pull off a sugar heist. Cuber shares stories about Jake and Finn building a time machine, Cinnamon Bun trying to overcome his fear of the dark and more. When Lumpy Space Princess is robbed, she immediately faints, and Finn and Jake must use their detective skills to find a suspect. Princess Bubblegum, Finn and Jake sneak into Wizard City to find a cure for Starchy's cold, but Princess Bubblegum is skeptical of magic. 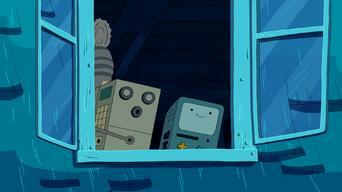 Finn and Jake disguise themselves as MOs in order to infiltrate the MO factory and save BMO from malfunctioning. 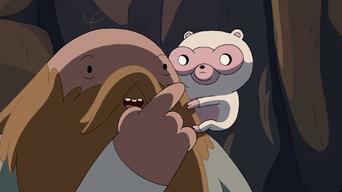 With the help of Princess Bubblegum, Marceline embarks on a mission to track down Maja the Sky Witch, who has her prized stuffed animal, Hambo. Finn wakes up in the middle of an exciting dream about Flame Princess doing battle with the Ice King, and he's determined to see how it ends. In the Earldom of Lemongrab, Finn and Princess Bubblegum meet a young lemon child and bring him home to the Candy Kingdom. Princess Bubblegum subjects Flame Princess to a series of tests, but the experiment backfires when Bubblegum must leave to deal with an emergency. The friends must defy the laws of space and time when Magic Man steals Jake's sandwich and hides inside a bubble made of molasses. When Finn starts having nightmares about the ghostly Green Lady, Jake and BMO help him get to the bottom of what's bothering him. Finn and Jake discover a train that has a new foe for them to fight in each car. Jake quickly grows bored, but Finn wants to stay there forever! Finn meets a boxed cat who rules over the Box Kingdom as the Box Prince. But an imposter has seized the throne, and Finn must help reclaim it. Finn, Jake and Marceline are stuck in a cave with no red snacks for Marceline to eat. If they don't find something soon, she'll feast on Jake's blood! While staying up all night to fix an old truck, BMO hears a rumor on a radio talk show that Princess Bubblegum is actually a monster. Tired of having Ice King as a houseguest, Finn and Jake invite a friend over to entertain him, but the pal and Ice King accidentally unleash a demon. When Kee-Oth the Blood Demon kidnaps Jake and takes him to another dimension, Finn enlists Lady Rainicorn's help to save his friend. 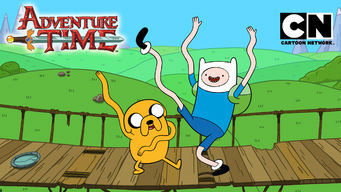 Finn and Jake are excited when Princess Bubblegum invites them to help her collect samples in the Desert of Wonders. 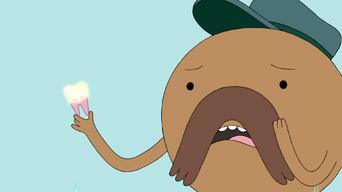 Root Beer Guy's humdrum life takes a dramatic turn when he witnesses Finn and Jake kidnapping Princess Bubblegum. But no one believes him! 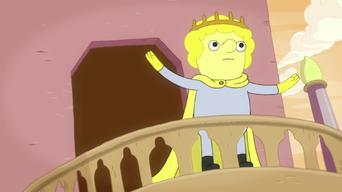 The King of Ooo agrees to officiate the wedding of Tree Trunks and Mr. Pig, but Princess Bubblegum believes he's a fraud. Season 6 of Adventure Time has 42 episodes. Because different Netflix countries have different availability for episodes, you'll need to check the episode listing below to see which are available in South Africa. 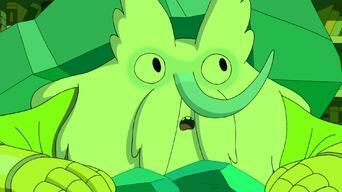 Finn and Jake have to commit a cosmic crime to find Finn's father ... if the Lich doesn't defeat them first. Finn and Jake follow the Lich to the Citadel, where Finn sees his father for the first time in a while. But how far does the apple fall from the tree? On a trip to a natural history museum, Finn and Jake learn about the food chain by being transformed into different animals and plants. Finn and Jake discover that Clone James keeps faking his own death to collect medals, and that there are actually 25 James clones on the loose. Finn isn't happy with any of the replacement arms that the princesses make for him, so he decides to build a tower into space to get his old arm back. It's Princess Day in Ooo! Guess what this means? 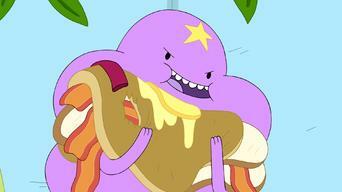 Lumpy Space Princess and Marceline join forces to play a prank on Breakfast Princess. Once a month, Jake's tail sneaks out to work in a traveling bug circus and assumes the identity of a clown named Blue Nose. Accompanied by a cheerful bee called Breezy, Finn decides to get back into the dating game. The handsome and sensitive Lumpy Space Prince escapes from his cruel parents to start a new life. BMO tells Finn and Jake they have too much money in their treehouse, so they go to Wildberry Kingdom and start spending all of it. Maja summons a tree person named Darren the Ancient Sleeper to attack the Candy Kingdom so she can harness its good energy for her magic. Shelby accidentally severs the lower half of his body during a party in Jake's viola, and his other half develops into a brother he names Kent. Fed up with Jake's lack of responsibility, his son, Kim Kil Whan, takes some disciplinary measures. Ice King and a group of wizards, including a guy they decide to call Giuseppe, go on a road trip. But their bus runs out of gas. A magic fighter known as the Peace Master comes to Candy Kingdom under the guise of saving it from an evil force. Jake tells a story about Finn and Jake's parents, Joshua and Margaret, fighting a menacing creature in the woods many years ago. Jake tries to fulfill a strange lifelong goal of being a brick inside a collapsing shack, then captivates Ooo with a radio broadcast. 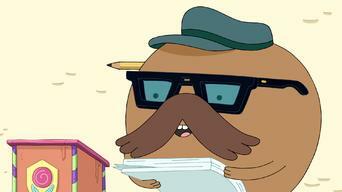 Tree Trunks and Mr. 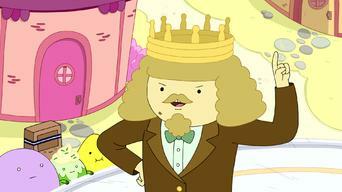 Pig's kid, Sweet P, has a rough first day of school, then the King of Ooo uses Sweet P's dance skills to make money. Millions of years ago, an Ice Elemental named Evergreen and his assistant, Gunter, try to keep a meteor from destroying Ooo. 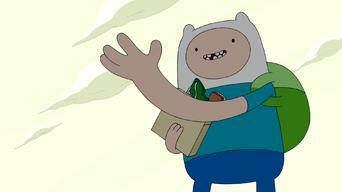 Finn has an extrasensory experience that takes him on a journey through all of Ooo and beyond. Jake kills a fly that eats some of his soup, but the spirit of the fly returns to the treehouse to seek vengeance. After a memorial service for Prismo, Jake starts acting strange, and Finn realizes that Jake has been transported to an alternate dimension. Magic Man gives Jake an injection that transports him into an entire civilization made out of his own flesh, and the inhabitants won't let him out. A vision leads Finn to a friendly civilization and a mysterious crash site. When the Fire Kingdom suffers a natural disaster, Flame Princess turns to an unexpected ally. 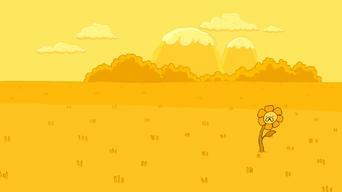 Lemongrab and Finn set off on a journey to explore the Mountain of Matthew. During a pajama party in Candy Kingdom, panic spreads when Finn and Princess Bubblegum disappear. Finn's toothache leaves him no choice but to go to the dentist. Susan Strong and her associates infiltrate the mysterious Super Porp factory. T.V., Jake's son, finds a secret diary and sets out to solve a mystery that has remained unsolved for decades. 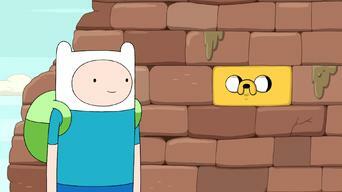 Finn and Jake stumble upon two different wells and are faced with two different destinies. Ice King plans to make a perfect circle of confidants. After a chilling encounter in their dreams, Finn and Jake decide to get back in touch with their reclusive brother. One day, Beemo's favorite artists find a new home in the treehouse. Stranded on an alien world, Cuber must rely on his bag of Graybles to survive. An unknown enchantress who appears in Finn's dreams distracts the Cosmic Owl from his duties. Finn and Jake break into Magic Man's home to rescue his new apprentice. 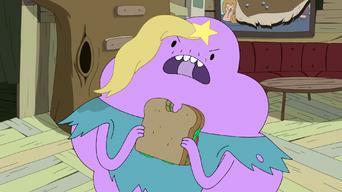 Lumpy Space Princess is fed up and leaves the forest in search of a glamorous career as a nanny. After suffering an accident in an octopus race, Gunter starts having strange visions. Martin the Human, Finn's father, fights to free himself from a new, strange planet! 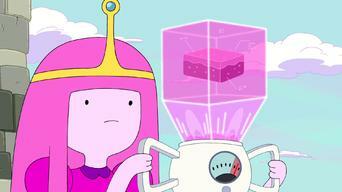 It's election day in Candy Kingdom, but a mysterious presence in the sky distracts Princess Bubblegum. 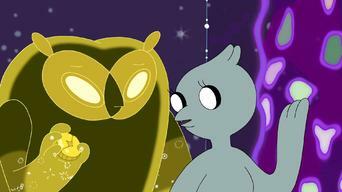 Finn, Jake, and Orgalorg converge with the comet and face their fate.